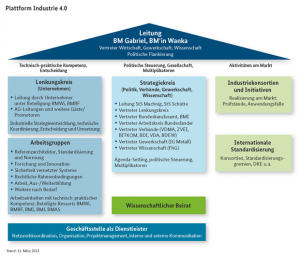 On the occasion of the Hannover Trade in April 2015, the new Platform Industrie 4.0 was launched. This platform is constituted of representatives from politics, associations, science and trade unions. Previously, the platform was only composed of industry associations: BITKOM, VDMA and ZVEI. Now, the platform is structurally reframed and also re-themed. The Platform Industry 4.0 is headed by Federal Minister of Economy and Energy Sigmar Gabriel, Federal Minister of Education and Research Johanna Wanka and leading representatives of the German Industry (Siemens, Festo, SAP, Deutsche Telekom) as well as from the IG Metall trade association, the BDI Federation of German Industry and the Fraunhofer Society. The participants work in interdisciplinary task groups on the future issues standardisation,research and security. Furthermore, the platform addresses the topics legislation, labour and education and training. The results from the task groups will be presented at the IT summit in Berlin in November 2015. Part of the executive committee are leading business representatives of the three important sectors for Industry 4.0: Machinery and Plant Engineering, ElectricalEngineering/Electronics and the ICT-Industry. Further information can be found on the web page of the platform: http://www.plattform-i40.de/. Digitisation poses challenges to the German Mittelstand: the digital connection of the machine park, the involvement of employees in interconnected work processes and secure IT solutions for protecting valuable company data. 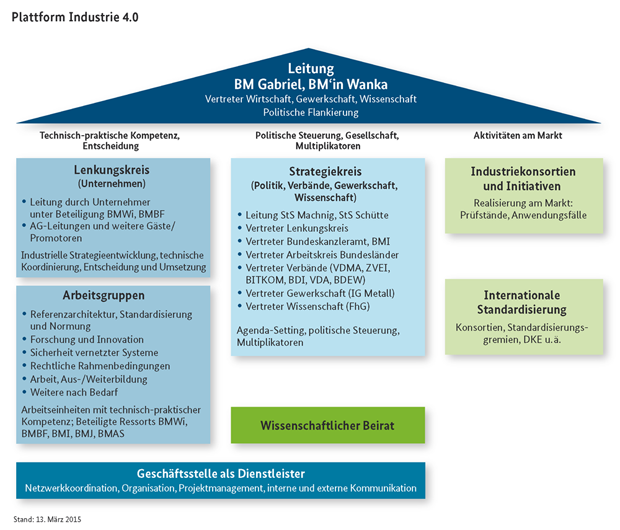 The initiative “Industry 4.0 – Research on the shop floor” (Industrie 4.0: Forschung auf den betrieblichen Hallenboden) is a contribution to this challenge. The Federal Ministry of Education and Research supports as part of this initiative nine applied research projects. These show on-site together with the enterprises how Industry 4.0 – solutions can be put into practice. In the three-year research projects, partners from industry and academia work together. In total, the projects are being supported with € 25 mio. One of the projects is RetroNet. The project aims at showing how SMEs can make their existing machine park and system components interconnected – without having to purchase new expensive machines. For further information, please see http://www.bmbf.de/press/3772.php.